It seems I'm not the only one noticing the decline of our society when kids no longer have an imagination to go outside and play because they are too hooked on playing video games. I remember when I was younger, my video games consisted of actually going outside and playing Wiffle Ball or a game of touch football. It wasn't MLB The Show or Madden Football. Today, my sister even makes her kids go out and play, so they don't lose that imaginative and creative spirit. Well, in New Delhi, a Stanford psychologist, Philip Zimbardo, suggested that online gaming would prove to be the fall of man some day. Though, most experts scoffed at his theory, which he laid down in his book, Man Disconnected, addiction to online gaming certainly seems to be taking a toll on the mental health of adolescents and youths. 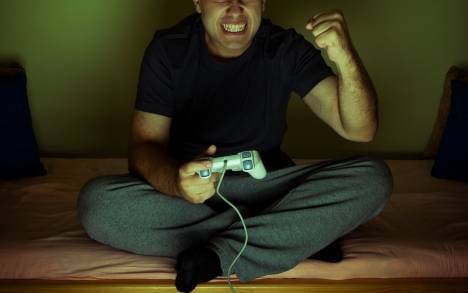 There was a case study on two brothers who were addicted to gaming and required months of rehab in the psychiatry ward of Ram Manohar Lohia Hospital in New Delhi, should serve as a warning that his theory could be true. The elder son, aged 22, was in his second year of college majoring in engineering, while the younger son, 19-years-old, was just finishing senior year in high school. By the time their parents brought them to the hospital, they were socially, and to a large extent physically, dysfunctional. Hooked to gaming, they had no time for studies, meals or bathing. Ew! The worst symptom they exhibited was the habit of urinating and defecating in their pants while playing their games. They became so engrossed in the gaming, they had no time for studies, meals, bathing, changing their clothes and apparently, relieving themselves. They slept a fair share, ignored phone calls and the doorbell, and twice they turned a blind eye to robbers cleaning out their house. A psychiatrist who treated the boys posted that the brothers' condition had gradually worsened over two years. He said, "Many parents come to us with complaints of children spending excessive time surfing the Internet. But his case was a shocker indeed. We had to admit them for over a month to reduce the craving for online games and prevent a relapse." Hey, I love video games as much as the next 40-year-old, but I do have responsibilities as an adult and gaming has become more of a hobby (when the wife's not home). To defecate and urinate in my pants, that's a little bit nutty. I have to be honest, though, this behavior can be attributed to poor parenting. If my children acted like this, no matter how old they were, the gaming system and anything you can use to access gaming would be locked up until responsibilities were taken care of. That's what good parenting consists of....DISCIPLINE!